While the term ‘junk silver’ might suggest that the coin is worthless, this isn’t the case at all. The term in fact refers to any silver coin which is in a less than perfect condition. The use of the word ‘junk’ simply means the coin has no numismatic value, and that they derive their value solely from the silver content of the coin. While these coins hold no value for collectors, they are ideal for those looking to invest in silver. Coins that are referred to as junk silver might be slightly worn or damaged and contain nicks and dents. They are not necessarily in a bad enough condition to be regarded as scrap silver. Often they are coins which have been in circulation in the past and have therefore received a noticeable amount of wear and tear over the years. This removes their collectable value, but their silver content remains and therefore they are of interest to those wishing to acquire silver. 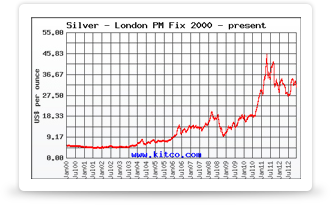 Low Premiums: junk silver coins are often available with little or no premium added to the spot price of the silver. This makes them better value for investors than mint condition coins, that are sold with a higher over spot price. Legal Tender: these coins are often regarded as legal tender despite their age. This means that should the price in silver drop significantly, some value can still be derived from the face value. Familiarity: as most of the junk silver coins on offer are well known to those in the trade, they are easily recognised and therefore their value is more widely known and less likely to be disputed. This is opposed to generic or no-hallmark silver bars and rounds which are less easy to verify. Size: as junk silver coins come in a range of sizes and denominations, from dollars to nickels, they are easier to trade in small amounts. This is in contrast to silver bullion which is often cast in large amounts such as 1 oz to 100 oz bars. Also, as the price of silver is lower than that of gold, these coins can still be fairly large in size but their value is a lot lower than that of their gold equivalents. This makes them ideal for those with small amounts to invest on a regular basis, as they can slowly acquire silver over time. Usability: should a situation arise where hyperinflation occurs and traditional paper money becomes almost worthless, having junk silver coins in your possession could allow you to use them as currency and trade them for other materials, goods and services. Gold coins wouldn’t be as practical for use in this situation due to their higher denominations and the higher value of gold. While there are lots of good reasons for buying junk silver, there are also a few things to consider when deciding to invest in this type of precious metal. Not IRA eligible: if you are planning on diversifying your retirement portfolio with precious metals, junk silver is not eligible, as its silver content is not high enough. While good junk silver is 90% pure, only bullion that is above 99% is eligible. Lacking the WOW factor: pulling out a sack of gold or silver bullion coins can have a tremendous effect on anyone who gets to see the contents up close. Unfortunately, some junk silver can look a little underwhelming, despite having a high silver content. This is mainly due to the wear and tear these coins have received over the years due to them previously being in circulation. As you can see, junk silver is a great way to build up a collection for investment purposes and for possible use as a currency in the future. There are lots of great reasons for choosing this form of precious metal, and if you can overcome the lack of sparkle then it is a great way to invest for the future.